The new product has been more than a year in the planning and has come about as a result of a contract packaging deal with Bloemfontein-based Sunkist Manufacturing. Cloudy Lemonade, Original Cream Soda, Cinnamon Cola and a first for Africa, Traditional Ginger Beer, are the flavour variants. 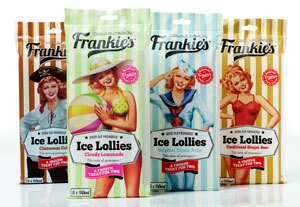 The lollies are packaged in a trademarked plastic tube that, when frozen, easily snaps into two equal parts creating a product that can easily be shared. They are attractively presented in the companies’ trademark ‘olde fashioned’ style and are packaged in bags of 5 x 90ml lollies per bag. To assist with the initial promotion of the new range Frankie’s have produced an eye-catching dump bin for in-store display purposes. As regards Frankie’s relationship with Sunkist, Schmidt says, “I believe the plastic tube was the only way to go when deciding the final look of our new product. We had hoped to deliver this new product last summer but production constraints meant that we had to put everything on hold until this year. Now that I have seen the final product, I know we have a potential winner”. The lollies have an RSP of R15 for a bag of five and will be widely available throughout South Africa by the end of October 2013. The packaging design is by Espresso, Durban, and the outer bag packaging itself is made by Packaging World, Pinetown. Frankie’s made big headlines late last year following spat with Woolworths over the retailer’s alleged plagiarism of its product concept.